A teacher is a person who provides education for pupils and students. Teachers, like other professionals, may have to continue their education after they qualify, a process known as continuing professional development. In education, teachers facilitate student learning, often in a school or academy, but also in other environments such as outdoors. A teacher who teaches on an individual basis may be described as a tutor. The relationship between children and their teachers tends to be closer in the primary school, where they act as form tutor, specialist teacher, and surrogate parent during the course of the day. primary school: The first formal, obligatory school. Usually begins with kindergarten or first grade and ends at fifth or sixth grade. Professional Development: The means by which people maintain their knowledge and skills related to their professional lives. lesson plan: A teachers’ document used to plan a lesson. A teacher is a person who provides education for pupils and students. The role of teacher is often formal and ongoing, carried out at a school or other place of formal education. In many countries, a person who wishes to become a teacher must first obtain specified professional qualifications or credentials from a university or college. These professional qualifications may include the study of pedagogy, the science of teaching. Teachers, like other professionals, may have to continue their education after they qualify, a process known as continuing professional development. Teachers may use a lesson plan to facilitate student learning, providing a course of study that is called the curriculum. Teachers facilitate student learning, often but not always in a school or academy. A teacher who teaches on an individual basis may be described as a tutor. The objective is typically a course of study, lesson plan, or a practical skill. A teacher may follow standardized curricula as determined by the relevant authority. The teacher may interact with students of different ages (from infants to adults), students with different abilities, and students with learning disabilities. Perhaps the most significant difference between primary school and secondary school teaching in the United States is the relationship between teachers and children. In primary schools, each class has a teacher who stays with them for most of the week and will teach them the whole curriculum. In secondary schools, they will be taught by different subject specialists each session during the week and may have ten or more different teachers. The relationship between children and their teachers tends to be closer in the primary school where they act as form tutor, specialist teacher, and surrogate parent during the course of the day. In 2010, there were 3,823,142 teachers in public, charter, private, and Catholic elementary and secondary schools. They taught a total of 55,203,000 students, who attended one of 132,656 schools. In 2011, American teachers worked 1,097 hours in the classroom, the most for any industrialized nation measured by the Organization for Economic Cooperation and Development. They spend 1,913 hours a year total on their work, just shy of the national average of 1,932 hours for all workers. 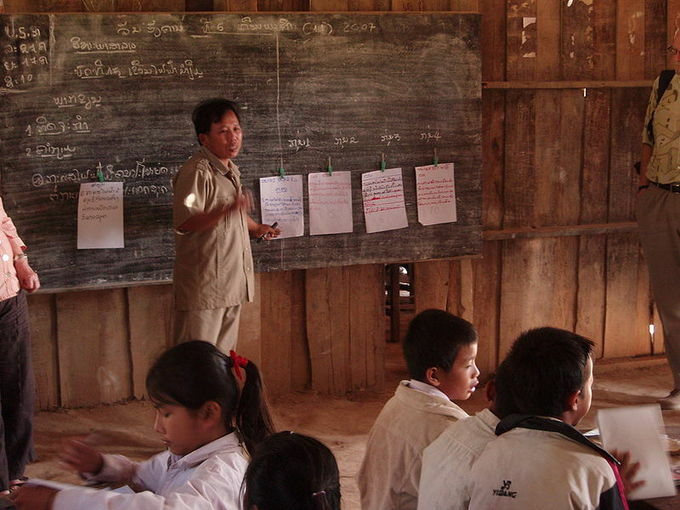 Teacher in Laos: Teacher in primary school in northern Laos. 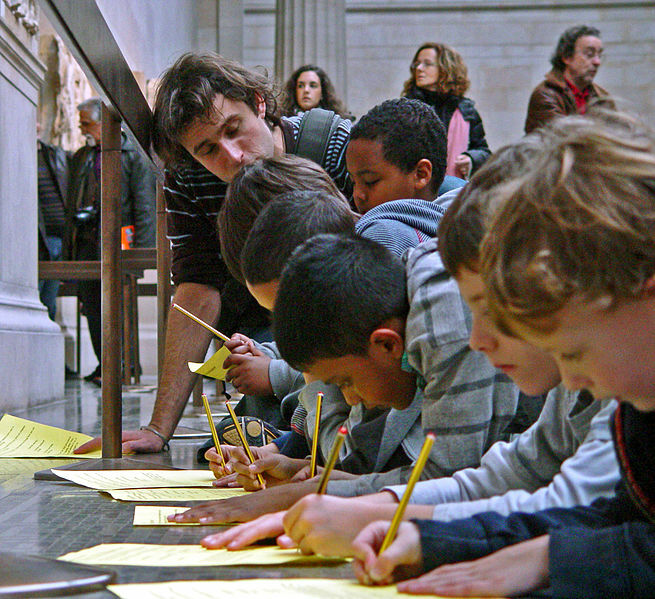 Teacher British Museum: A teacher and young pupils at the British Museum Duveen Gallery.